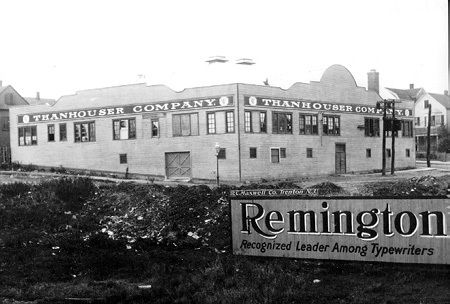 A view of the Thanhouser Company building, circa 1910-1912. The Remington sign was meant to be read by railroad passengers on a nearby line. From December through early March 1910, a half dozen or more films were produced by the fledgling Thanhouser Company. All were of one-reel length, approximating 1,000 feet. Two directors Note were on hand, Barry O'Neil, who had worked with Edwin Thanhouser earlier during his stage career, and Lloyd B. Carleton, a stage producer for the Frohman organization, who was at liberty when he signed with Thanhouser in 1909. Barry O'Neil was the stage name of Thomas J. McCarthy, a son of Irish immigrants, who by 1908 had acted before the footlights in numerous Irish roles and had been a director for several stage troupes, including Edwin Thanhouser's short-lived Bush Temple Theatre company in Chicago. The following year he entered films with the Thanhouser Company, and for the next two years or so he directed most of the firm's important films, including the first two-reel picture, Romeo and Juliet in 1911. By 1912 he had moved to Lubin, where he gained a reputation for being a pompous know-it-all who was not above endangering his players in the name of realism. In July 1915 he went to the World Film Corporation in Fort Lee, New Jersey, where he was active for the next several years. His wife, Nellie Walters O'Neil, was a stage actress who retired in 1909 when her husband went to New Rochelle. She was the daughter of Mrs. George Walters, who at one time was a Thanhouser actress. Lloyd B. Carleton was the stage name of Carleton B. Little, who followed a distinguished stage career after his graduation from Columbia College. His first film work was with Edwin Thanhouser, beginning in 1909. As it turned out, he would direct for the Thanhouser Company for just a short time. By the end of summer 1910 he relocated to Biograph, and then went to Lubin where he directed his own stock company. He later moved to William Fox's Box Office Attractions Company and, in the autumn of 1915, to Universal. At the time it was not industry practice to credit film directors, so the identities of O'Neil and Carleton usually were not mentioned in studio news releases, and students of film history have been able to make attributions only on the basis of widely-scattered contemporary newspaper articles, interviews, and other items mentioning one or the other. The first Thanhouser cameraman was Blair Smith, earlier with Edison, who came to New Rochelle at the start of business in 1909 and who photographed The Mad Hermit, the first Thanhouser subject. As has been noted already, The Mad Hermit had enough plots for a dozen or more pictures. Certain of its scenes were awkward, notably one showing the tossing of a stuffed dummy, representing a child, which burst in midair and spewed forth a flurry of sawdust. Perceived by Edwin Thanhouser to be an amateurish production, The Mad Hermit was put on the shelf and not released until August 9, 1910. Within a week or two another cameraman joined the Thanhouser Company, Carl Louis Gregory. With Edison earlier in the year, he had been a still and motion picture photographer for much of the preceding decade and had traveled widely on behalf of impresario Burr McIntosh, the United States government, and his own companies. Thanhouser acquired a genius in Gregory, who remained with the studio until 1915. He was not only a competent technician but a photographic artist as well. Gregory was to achieve great prominence in the motion picture industry and to remain active in the field through the 1940s. Cameramen, like directors and players of the 1910 era, were not credited in advertising or publicity. However, it seems likely that a good number of Thanhouser releases during the next year were filmed with Gregory turning the crank. During the beginning months, Alfred Huger Moses, Jr., who was to remain with the firm for most of its existence, also did much important photography. It fell to the cameramen to take stills as well as motion pictures, with the stills being used in Thanhouser advertisements and publicity releases. In the meantime, Edwin Thanhouser's brother-in-law, Lloyd F. Lonergan, who was a full-time newspaper writer, was busy furnishing scenarios. From his fertile mind came a never-ending stream of stories, ranging from comedy to dramatizations of Shakespeare's plays, from mysteries to tales based upon current events. Motion Picture Man Caught Speeding: Edward [sic] Thanhouser, residing at 205 West 94th Street, Note Manhattan, who is about to open the roller skating rink here for the manufacture of moving picture films, was arrested Saturday night for operating his automobile at the rate of 25 miles an hour on Jerome Avenue and 154th Street, the Bronx, and was held on $100 bail for trial at special session by Magistrate Steinert. At the time of arrest he was following an automobile ahead of him which chauffeur was also arrested. He told the officer that he followed this automobile so that he would not get lost as he did not know the road. Mrs. Thanhouser and another woman were with him. During the first months Edwin Thanhouser hired actors and actresses from agencies in New York City, especially through the offices of George D. MacIntyre, a leading agent. Note Players between engagements on the stage were happy to take the short train ride to New Rochelle to earn $5 per day Note acting before the motion picture camera. Gradually a company of stock players was built up, but even these players would occasionally depart for stage engagements before the footlights. Actresses on the permanent payroll included Anna Rosemond and Violet Heming, as well as Carey L. Hastings, a sister-in-law of Edwin Thanhouser. The two leading stock company actors in 1910 were Frank H. Crane and Martin J. Faust, who were soon joined by William Russell. Marie Eline, born in 1902, was the youngest member of the permanent company. With additional players, and a crew to operate the film laboratory and tend to the office, the Thanhouser Company at the outset employed about three dozen people. In addition, dozens of others were hired on a part-time basis or for special projects. The order of production of the next several Thanhouser Company films after The Mad Hermit is not known, but among them was Aunt Nancy Telegraphs, produced in December 1909 from a scenario by Lloyd F. Lonergan, a one-reeler that was never released. From time to time Thanhouser cameramen would photograph civic events, scenery, and fires in New Rochelle, and during the first several months of operations an inventory of several thousand feet of stock footage was created in this manner. Years later Note Edwin Thanhouser's children would recall that the company would send a scout to find a house or other building that he thought was very handsome and get permission to photograph it. Then a story would be written to include the structure. Whenever the studio learned of a fire, a parade, a wreck, or some other disaster or interesting event, the firm would send a director, a leading lady, a leading man, and perhaps a comedian, who would go through various actions in front of the camera, with the disaster or whatever in the background. Then the crew would return to the studio, Lloyd F. Lonergan would see what had been photographed and write a scenario for yet another film. To complete the story in logical fashion, additional scenes would be taken later on studio sets.